With Small Business Saturday deals, the Jingle Around Golden Passport, and all of Golden’s holiday shenanigans, there are plenty of reasons to hunt for gifts in Golden this season. So we’ve put together a little guide to help you find the right presents for everyone on your “nice” list. For Him Bikes He’ll Like- Know someone who might enjoy an afternoon on an e-bike? Gift them the gift of an e-bike rental from Big Ring Cycles. 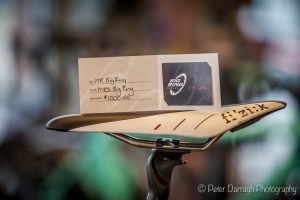 Or who wouldn’t love the gift of a professional tune-up or bike clean from one of Golden’s many bike shops? Gift cards can be purchased in any denomination or for a specific service. Help your loved one enjoy Golden’s beautiful trails and roads. Holiday Spirits - A bottle from State 38 Distillery, hand-made in Golden is a perfect gift for the holidays. Treat your favorite guy to an award-winning agave-based spirit made in small batches and using only organic ingredients and crisp Rocky Mountain water. Along with State 38’s tequila-inspired agave spirits, choose from gin, vodka, and whiskey. 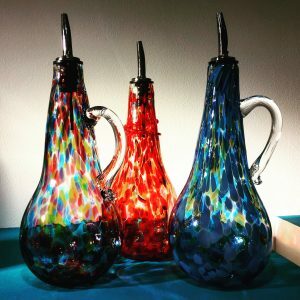 For the Beer Lover - Grab a carbonated beer growler, an upcycled beer caddy, railroad spike bottle openers, or beer bottle candles from Blue Moose Trading Company. And don’t miss the Coors Brewery’s well-stocked gift shop for all kinds of Coors gear and fun gifts. For the Adventurer - There’s no shortage of fun adventurous gear in Golden. 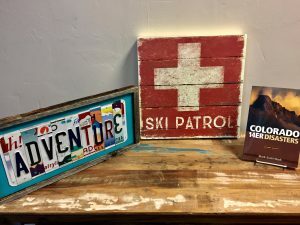 Blue Moose Trading Company sells a locally made license plate "Adventure" sign, a SKI PATROL sign, or a 14&apos;er disaster book. Pamper Her - Spinster Sisters is the way to go for luxurious gifts like sleep masks, bath butta bombs, candles and home spa sets. 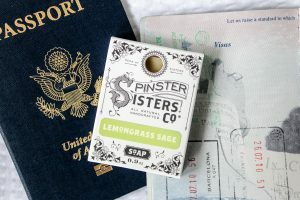 And Spinster Sister’s travel sized items make the perfect stocking stuffers. Pick up travel sized solid lotions, clay masks and more. Or head to Woodhouse Day Spa or Urban Escape to pick up a certificate for a luxurious massage, facial or other treatment. Jewelry & Clothes - Truly BoHotique boasts locally made jewelry that makes for great holiday gifts. With Colorado branded gear including hats and beanies from Yo Colorado (a Golden company) and Colorado branded T-shirts and thermals from Mountain Moon (another local company), supporting Golden artisans is easier than ever. Or visit Baby Doe&apos;s Clothing, Artisan Jewelry & Fine Craft where you’ll find lots of items for the ladies on your list including soft and colorful knit and crochet scarves, stocking caps, and beanies from locals. Warm up her home with artisan-crafted gifts from Angelic Relic and Nina Sampsel. Help her get cozy with whimsical and comfy P.J. Salvage pajamas and slippers. Elevate her accessories with Maruca bags in all shapes and sizes, designed and crafted in Boulder. And so much more. Artisan Gifts for All - Foothills Art Center Holiday Art Market (HART) features the creations of over 100 local Colorado artists working in the highest standards of handcraft, including fine ceramics, fiber, glasswork, jewelry, paintings, woodworking, photography, holiday items, and more, HART is a “cool” holiday art market and an ideal shopping destination for unique gifts. HART runs through December 30, offers free admission and is open seven days a week. Cozy Quilts & Supplies - Find a beautiful one of a kind quilt for that special someone at Golden Quilt Company. It’s the place to shop for the twenty-first century quilter with over 1,000 bolts of quality quilting fabric, patterns, books, notions and gift items for all skill levels from beginner to advanced. Family Adventures – Pick up a certificate to Gambit Room, the new "escape room" experience in downtown Golden. GOLDen ORE BUST! is a family-friendly puzzle room for up to eight guests. Your objective: find the gold and figure out how to get out of the mine in 60 minutes or less. Gift certificates are available. 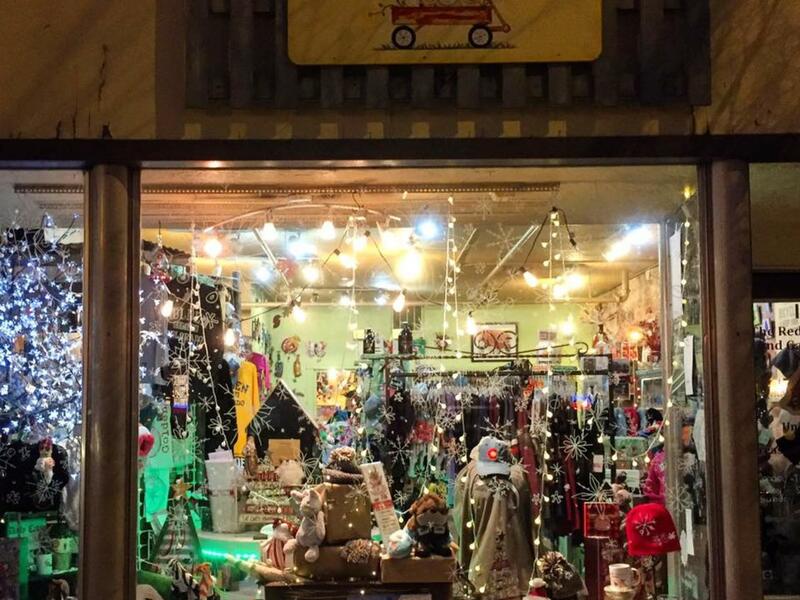 Classic Toys, Cuddly Stuffed Animals & Great Games - Avenue Gifts - This quaint shop on Washington Avenue in downtown Golden carries Bearington Bears, Melissa & Doug Educational Toys, Cotney Peak Demdaco, Willow Tree Angels and so many other lines of toys. You’re sure to find the perfect gift for the little ones. 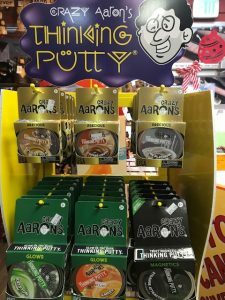 And at Golden Goods, you will have a ball browsing their holiday gift ideas that are always a hit including Crazy Aaron&apos;s Thinking Putty, Legos, Orb Factory craft kits, Metal Earth kits, puzzles and games! Pet Lovers – Head to the Green Paw & Spa, which provides holistic living for you and your pet by providing natural, nourishing and environmentally responsible products and quality information. Enjoy the unique selection of food, treats, supplements, toys, bedding, games, gear, grooming supplies and much, much more. Of course, pets are welcome. You’ll also want to check out Golden Mill Country Store - Golden Mill has been feeding Golden’s animals for over 100 years and is a full-service animal feed and country store. Offering a complete line of premium pet food, Golden Mill carries the best premium brands of dog and cat food. The store is also stocked with a wide array of pet toys, treats, leashes, collars, bowls and other pet accessories. Just in case you need a refresher, here’s some information on Small Business Saturday in Golden. Shop and dine in Golden on Small Business Saturday, Nov. 25. Be sure to stop by Visit Golden’s Shop Small Welcome Station, located on the East side of the visitors center, from 10:00 a.m. to noon to pick up a Shop Small tote bag, sip a hot drink and enjoy the festivities before experiencing Golden’s five shopping areas. Plus, this year we’re introducing the Jingle Around Golden Passport program that will run from Small Business Saturday (Nov. 25) to December 31. Pick up a passport at Golden’s SBS Welcome Station on Small Business Saturday or at the Golden Visitors Center for a chance to win $100.